I feel bad for anyone who happened by Rave Motion pictures at 2:30 this morning. They were probably surprised to see the deluge of traffic such that they might expect at 2:30 in the afternoon. Tonight was the premiere of the Hunger Games and unless you’ve been fasting from all forms of media for lent, you’ve probably heard something about this ‘next big thing’ movie-based-on-a-book-series. If you’re ‘Oh crap not another ‘Twilight’ antenna just went up, don’t worry. This book series is actually excellently written. I’m not the only one who thinks so. Stephen King is actually quoted on the book jacket, talking about how great it is. I think it’s important to note that Stephen King also said, “Harry Potter is about overcoming adversity – twilight is about the importance of having a boyfriend.” Comparing this book to twilight is like comparing apples and some fruit that is only interesting to pubescent girls with bad taste in books. The first twilight movie made $7 million at it’s midnight showing whereas Hunger Games grossed over $19 Million. This movie has legs and it’s going places. The Hunger games is an especially violent and tragic series of stories that center around Katniss Everdeen who lives in a dystopian future where the US has deteriorated into a country called “Panem” which consists of twelve districts and an enormous capitol that looks like it was an architectural design collaboration of Cosmo S. Spacely and Senator Palpatine. Ultimately the movie is a win. There’s no doubt that Lionsgate has found their Harry Potter. But how does it compare to its epic source material? When a popular book is adapted for film I put the changes made from the book to the movie into one of four categories: changes for time or budget reasons, changes to make the film more appealing a larger audience, additions that work on film but wouldn’t have in a book, and stupid changes that no one likes. While there were some very noticeable differences between the film and the book, the changes are almost all positive. The book is written from Katniss’ point of view so you’re going to see some immediate differences when you realize that the movie has no trouble leaving Katniss and showing us what’s going on elsewhere. The first scene of the movie is an interview with the head Game Maker Seneca Crane. In the book Crane doesn’t have a speaking role. In fact, we really don’t find out his name until the second book. In the movie he’s a principle character. Crane’s struggle to maintain control of the games and satisfy president Snow is a lovely subplot that gives a window into what the next two movies will be like. It also gave us Wes Bentley (a Methodist pastor’s son btw) for more than just a cameo role. Donald Sutherland plays the conniving president Snow who has ruled over Panem since before the rebellion (making him probably more than 100 years old, though he doesn’t look a day over 90.) We don’t hear from him until the second book, but in this movie we get him for several brief scenes that establish him as the major antagonist of the series. The only place where I wish they could’ve remained more true to the books would’ve been the interviews with the tributes. I would’ve like to have seen the full interview with Katniss as it was described in the book. I would’ve liked to see the interview with Rue. The acting in this movie is spot on. Jennifer Laurence shows us why she was nominated for an Oscar two years ago. I was most impressed with the scene before Katniss is sent into the arena. She looked like I would expect someone to look if they were knowingly headed toward a gruesome death. Stanley Tucci plays a perfect Ceaser Flickerman. Elizabeth Banks was born to play Effie Trinket. Josh Hutcherson is a great, albeit less broad-shouldered Peeta than described in the books. Cato, Clove, Glimmer, Foxface et all are pretty much perfect. Woody Harrelson plays a fabulous Haymitch; even despite the terrible wig they had him wearing. My only beef was with Liam Hemsworth as Gale. Perhaps it’s the fact that he’s the only non-American in the main cast, perhaps it’s that I never liked the character of Gale or maybe it’s just that he’s taller and much better looking than me – I can’t be sure. I think it’s just that he botched most of the ten-or-so lines that he was given. On the continuum of movies based on books the Hunger Games is closer to Lord of the Rings than Twilight. It is shot with more artistry and told with more poise than you might expect from a ‘teenie bopper.’ If you’re a fan of establishing shots prepare to hate this movie. Any wide shots last less than three seconds and all other shots are as close as they can get. Also if you get motion sickness I’d recommend heading to the back of the theater – Gary Ross didn’t bring his Stedicam to set. In addition to staying close to the action (a daring but effective choice) the biggest difference between this and similar movies is the use of silence. During several moments of the film instead of announcing to the audience that they should be sad by throwing in some over-powering score, the director chose to keep it silent. There is a fantastic score during many scenes, but a few key moments are left without any music – allowing the audience to feel what they might feel if this really happened. The blow is not softened by music. Perhaps the best example of this is during the reaping, when Katniss’ kid sister Prim is randomly selected to participate in the games and Katniss volunteers to take her place. You really feel the pain, the awkwardness, the horror of what the characters are going through. What is perhaps most impressive about the movie and book are the complex themes. Dehumanization in an increasingly consumer driven and mechanistic society is perhaps the primary theme. These aren’t topics that most teenagers are discussing these days so it’s a great way to ask questions regarding what the limit on entertainment is. I personally see parallels betweens The Capitol and the Districts and the US’s relationship with developing countries. I’m hoping fans of the book might do the same. Someone asked the questions ‘why do we praise teenagers killing each other.’ I should specify that the book and the movie do not praise killing. The society depicted in the books does, but they are depicted as self-centered and desensitized, not totally unlike our own. It’s actually a very powerful allegory. The watcher walks away asking the question ‘have we become like this society?’ The point is similar to that of Jonathan Swift’s “A Modest Proposal.” Swift wasn’t actually suggesting that people kill children either – his point was how society has moved toward an amoral, godless society that doesn’t value life. I would not recommend this one for the kids. It is a very violent movie, with characters dying of spears through the stomach, a snapped neck, arrows to the chest and being torn apart by wolves. So I’d say anyone much younger than 15 would probably be pretty disturbed by the violent deaths of several teenagers throughout the movie. All in all it’s a very impressive film. It manages to question society in some poignant ways wile telling an entertaining story. I’d really recommend going to see this one. Try to catch it this weekend and if the tickets are almost sold out, may the odds be ever in your favor. fascinating! I told Dad he needed to read this before tomorrow! AMAZING review of the books and movie. I think it is great that another young person has A. good taste in books (I like twilight too BUT I realize it is just a fiction book and not reality. And not a terribly good fiction series when against Harry Potter, The Hunger games or older works like Stephen King, who is a favorite!) and B. has the ability to see past the disturbing nature of the book and see how we could, without God’s grace become a nation that does these exact things! We went to see the movie last night and found it riveting. Your post/review is certainly spot on as far as we are concerned. I still haven’t read the book so I am wanting to do that and then might have further to say. We commented on the whole idea of the capital being the USA and the districts being third world countries that are being drained of their resources for our comfort and entertainment! And I found the fact that Katniss and Peeta were willing to go against the prevailing attitude and sacrifice themselves indicative of the fact that the whole thing was written to show up the horrible state of the society. One does wonder how far we are from something this extreme and heinous! I’ve heard about the movie for around a million times already, and still I’m not sick of it. I haven’t watched the movie yet but I’ve seen a lot of captured moments and reviews about it, and also (pardon the serious part) the statistical data on its marketing value. 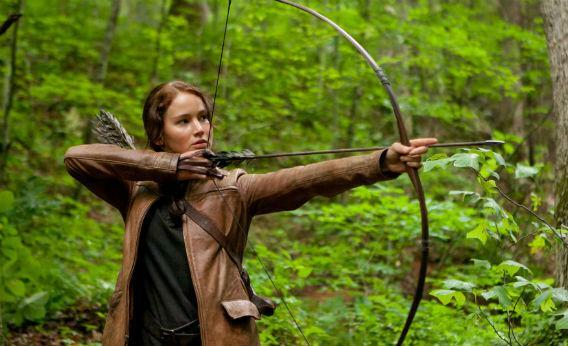 Hunger games has impressed millions of people internationally and even now the fad has not ended yet. This excitement causes a stir in the crowd and lures more people into watching it and that’s great progress. You took the words right out of my mouth. I’ve never in my life seen a movie I was more satisfied with in comparison to a book in my life. But I’ve also never been so moved by a book series the way this one did.